FYI: There's a second blend motor on the driver side. 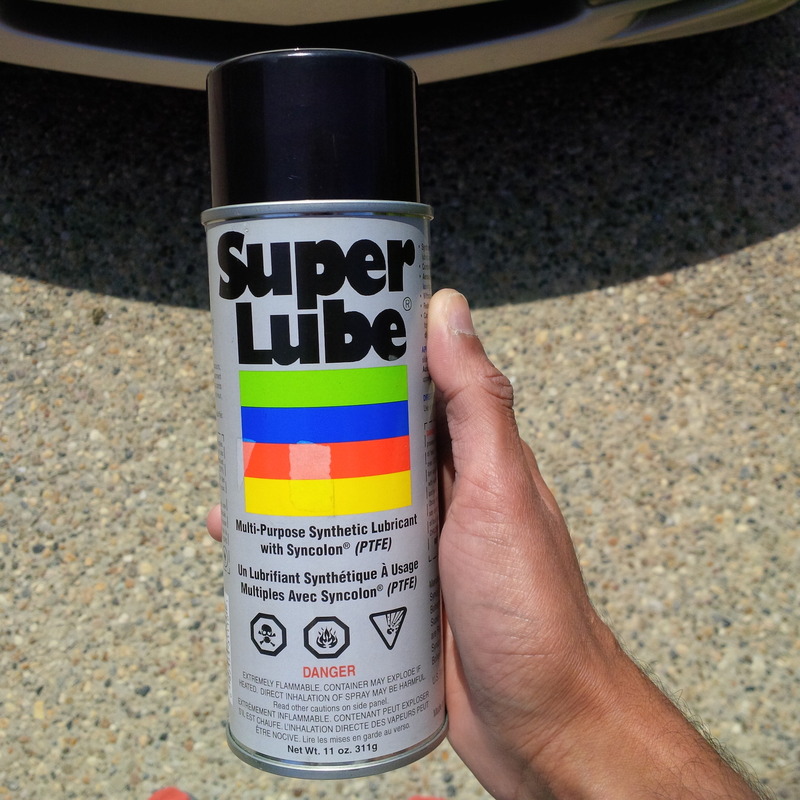 I reused the lube in side the motor to grease the gears. There is enough excessive grease cling to the sides of the gears to reuse. If you buy grease make sure it's plastic compatible or it will eat up the placsti parts. It that the "Mode Control Motor"? I don't know the official name of the part. The part moves when you turn the temperature dail so i believe it's the blend door motor. 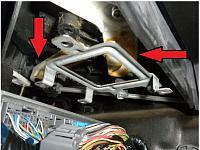 The "Mode Control Motor" = The one that re-directs the air from Front Vents to Foot Vents and Etc. The "Recirculation Control Motor" = The one that changes from Inside Air or Outside Air. I believe the one you fixed is the Mode Control Motor. Just spoke to the dealer. You're correct driver side is a Mode motor. Pass side is call a Air Mix motor. But check this out LOL. Mode motor is $361.00 and Air motor is $250.00. WHAT!!!? Dealers like always are insane.... I junkyard that sucker! Most junkyards never disassemble the Dashboard so odds are you will find it on most Accords, Oddyseys, TLs, Pilots perhaps even the Civic? They sell them for like 20 bucks a piece.. I finally took this project up. It sure is a p.i.t.a if the arm isn't aligned properly. Luckily my pops came up with the idea to move the a/c dial enough to move the arm in the right position. In my situation the gears looked great and the only thing i could think of being an issue is excessive plastic bits from plastic grinding i presume. We sprayed all the loose bits and lightly lubed up the pieces using what was there. After putting it in i played with the temp and watched the arms move accordingly without and noise. I will have to check when i actually go on my hour drive to class this coming week. Spray the valve on the outside heater tube with some WD40 so it doesn´t stick.. Too much rust or dust in there will prevent it to open smoothly and will break the gears again. I usually wait until i get cold air, Next time i get ready to drive, i'll spray some WD-40 on the tube in the engine bay. If I screwed up the motor/arm positions??? Thanks to everyone for all the great information so far. I've read numerous threads while trying to fix my climate control problem on my '01 Acura CL, read the service manual, and I still can't get the climate control to blend temperatures properly. 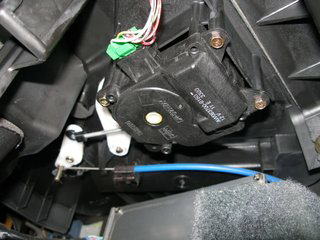 I've got the all heat or all cold problem, code "i" on the climate unit DTC, I've checked the mix motor a few times, lubed the heater valve/cable in the engine compartment, and ensured that the mix motor arms are inserted into both white plastic arms. I know that I screwed up the mix motor gear armature and arm positioning when I took the mix motor apart the first time. I didn't pay attention to where the main gear was positioned or whether I set the climate control to full cold or full hot. I've messed with the main motor gear positions and I've moved the white plastic arms that open the flaps, but it still doesn't work right, and I don't know what the correct position should be. Can anyone let me know what the full cold or full hot position of the white arms should be? I've marked the arms with red arrows to help make sense of what I'm asking since I don't know the correct names of the parts. If you can let me know what the position of the main gear on the mix motor should be, that'd help even more. When I took mine out i marked it accordingly but even then it didn't want to align correctly.. When i started turning the A/C knob my pops realized that if we change the temp to a certain point it allows the piece to fall into place. It's best if you can have a second person turn it until you can tell that it will fit. P.S, we didn't put the far left screw in. Instead we zip tied that hole so there was no chance for it to start separating. Thanks for the help, Jerzyboi. I appreciate the good tips. As of yesterday afternoon, I disassembled the heater valve cable and calibrated it according to the service manual. The cable moves freely, the heater valve opens and closes, the flaps open and close under the dash, and I think I realigned the mix motor arm with the white valve and door arms correctly. I also disassembled the air mix motor again and corrected the orientation of the main gear as well as pulling up the copper arms to make better contact with the armature. For others that mess up the arm and air mix motor gear alignment, turn the climate control to full cold, the arm closest to the glove box should be moved parallel to the passenger side doors--this closes the heater valve, and I'm 98% certain that this allows only one other possible configuration for the flap door arm under the dash. I can't see where the flap door is, so I don't know of the proper setting on it, but after playing with the settings for a while, it seems like there should only be one way the two white plastic arms can work together without getting jammed up and stuck. All that said, I still haven't found the solution to my all heat or all cold problem. I'm going to follow the advice of some 3G TL owners that simply removed the heater valve cable altogether and manually pushed open the heater valve to remain open all the time. That way, my old, tired air mix motor only has to open and close a simple door flap. If this doesn't fix my problem, I'm going to have to finally spend some money on either a heater valve, new air mix motor, or new climate control unit. Hopefully not all three. Are you having issues getting the piece lined back up it's spot? Sounds like it might be a little bit more involved in your case. The only way I was able to line it up was to turn the knob until the arm moved enough that it would fit into place. It's tricky if your doing it yourself because your literally getting out of position to turn the ac knob slightly to get it right, unless you have some really long arms. Last edited by Jerzyboi; 09-19-2016 at 02:29 PM. Reason: added a bit more information. For those doing the mode mix motor(driver side), It is also a bit of a pain to get to but not bad after doing the right side.. The upper left screw(closest to the firewall and) is especially tricky since the cruise control module limits your room for a philips screw driver. If you have an L shaped screwdriver that will be your best friend. 99' TL( Should be essentially the same through the generation). 4)lay on your back and the module is right there with a green connector with a gray/red tab(depending on the year i presume). Hello everyone, I bought an Acura TL 1999 in last month. Previous owner removed the air mix motor (from the passenger side; because it was broken) with the metal bracket and he put it somewhere and don't know where... I have bought new air mix motor already but i don't have this metal bracket... :/ I'm from Poland, so it is a problem to get it. Could anyone measure this metal bracket for me? Or could someone do some photos of mounted air mix motor, so i would know in which position it should be placed? Please, help me! I'm waking this thread back up because I finally solved my problem. After going through two different salvaged climate control units and still getting the same "i" code, I bought a salvaged mix motor and installed it today--this completely fixed my error code. I should have tried this a long time ago, but unfortunately, I was relying on the service manual too much which calls for investigating an "open" in the electrical system or replacing the climate control. After finding a thread in the 3G TL forum stating that the mix motor is the fix, I picked one up and solved my problem. If anyone else has the same problem, make sure and check this fix. My bad mix motor would move completely back and forth when the lowest or highest settings on the climate control were initiated, but the mix motor should move incrementally as the climate dial is increased +/- along the wheel. I'll try to send you a few photos of the metal holding bracket soon. You could probably make one of your own--the bracket uses three screws that hold the mix motor up by mounting to parts of the dash. I think the mix motor has three or four screws that hold it to the metal bracket. Make sure the green female electrical end is facing toward the cabin and that the white arms are pointed up into the slots of the white door flaps. Thank you, I'll be glad for your help. I have the air mix motor, so I know its dimensions, also i know dimensions of screws holes in a car which holds this metal bracket. I need to know their mutual position and how high is this bracket to make it of my own. thanks skirmich, i appreciate your contribution. i've had mine clicking for almost ten years but didn't really know what it was. no more clicking when it turns over and i can't tell you how delighted i am. my car is probably in its best shape since 2005. Nice! Better late than Never right? just a question: would it be obvious if the linkages were not properly connected? the reason i ask is because today i have tried the max hot setting (90F) today (weather was 64F approx) and i could not get super-hot air. i ensured A/C was 'off' and also 'auto' was disabled, and it seems the air was not as hot as i'd expect (i thought it'd blow super-hot air). in any case, while i await your response, i am going to check the linkages again. fixed. my apologies skirmich, nothing wrong with the instructions you gave. i stupidly had the bracket on in reverse; that is, the two holes in the back to secure the bracket were in the front. since they had fit pretty well (two of the three. i lost some sleep last night wondering about the third, since the motor pivots and i thought a third screw would have been optimal), i thought i had installed everything correctly. after flipping the bracket and reinstalling, i now get hot air. i hope that any reader looks hard at the linkages underneath where the motor fits, since they can be adjusted easier than opening the motor and moving the gears to get it to fit correctly. haha Sorry I could not catch your previous response, But congrats again! i managed to switch out my air mode control motor today as well, just to be complete. while it's much better than my old one, i've noticed that the linkage can get momentarily "stuck" when changing from a mode like defrost/footwell -> front-facing vents by the steering wheel. i hear a brief knock but the mechanism continues on and, from what i can tell, it manages to move to the proper position. since i have to pay the stealership to troubleshoot my broken auto window, i was hoping maybe i could ask them to "diagnose" and they can fix it within the cost of diagnosis since it seems like shin-etsu isn't sufficient to grease where it gets "stuck". have you ever experienced this issue at all? mine must be from age (car turns 16 this september), but i was hoping maybe you'd have some tips. it's nothing super annoying, because on auto the mechanism moves much slower than when manually flipping modes from one extreme (defrost/footwell or defrost) to another (front-facing vents only). thanks again for your tutorial. i found the mode motor somewhat easier since its linkage is much smaller, but the top screws on its bracket are much more annoying than the back two screws on the mix motor. hahahah some uneducated or casual readers must be thinking i'm out of my mind to do all this work to my car (nav harness swap, mix/mode motor(s) swap, throttle body swap, resonator replacement, ground cable replacement, splash shield replacement, inner fender replacement, are what comes to mind in the past 2 months), but damn do i love how it looks compared to the rest. only 127k miles (205k km) over the past 15 1/2 years. figured i should show it a bit more love than the past 6-8 years when i badly neglected it. I hooked up my neutral safety switch in the wrong position. Now the car doesn't start in park but starts in reverse.Any help please!!!! Make your own thread. This thread is about the Air mix motor. looks like spraying the mode motor area with some of the Good Stuff did the trick (i didn't expect it to). after applying it, i played with the modes and noticed no difference. I am thinking about doing this as right now I can only get heat from the A/C. 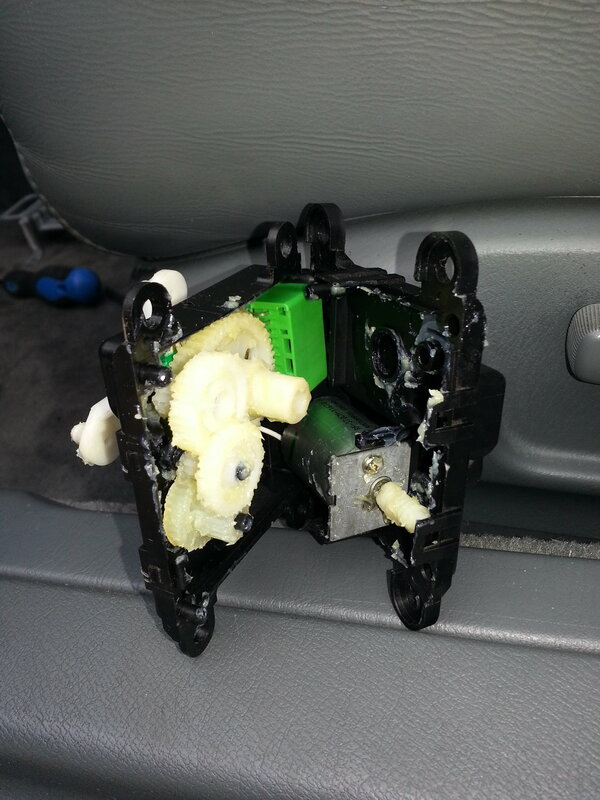 I am thinking I blew the air mix controller when I jump started the car. Before I do this, I just want to see if the mechanism moves the door, so my question is... where exactly can I find this part? Is it on the passenger side or the driver's side? Do I have to peel back any carpet? I have already changed the blower motor resistor... based on the pictures / diagrams, it seems like the air mix part is just to the left of the blower motor resistor, right? I haven't looked for it yet, so maybe it's obvious, but just wanted to get a sense of where to look. Look at the passenger side foot well.. Behind the center console at the very end you should see the engine ECU near the floor? The Air Mix Motor is just on top of it! You cant miss it, look for the super obvious green connector it has. I actually just signed up so that I could thank you. OUTSTANDING explanation and pics! Very much appreciated!!!! This is an enormous up with my 2002 Acura. Thank you! Your welcome man! and welcome to the forums! This site and the diagnosis and repair instructions are just the best. I can't beleive such a service and helpful individuals are still in this country. Thanks so much for all the above. Making note of every step of the way from removal to re install is a must, at least for me. I got some positioning of the parts confused even after making marks on the unidy. They all got swept away by the dielectirc grease on my hands. It's impossible to avoid. Also one of the helpful photo's didn't have a view of all the inbox gears and their positions. I'm not a mechanic in the true sense of the word but take heart all that would be attempting the FIX, it can be done and with the material provided it'll give you the confidence to complete the job to success. I am glad the DIY was helpful! Thank you for the kind words. Once again this forum saved me a lot of money. This week I noticed even though I had the heat on the car was blowing on my face. I tried defrost and it still kept blowing on my face. Turns out for my 2000 the little motor wasn't too bad but it was the actual mechanism physically on the car that wouldn't move well. Once I lubed that up it's good as new.